Jasmine: Tip big boys, tip big because you get good service and they count on tips. 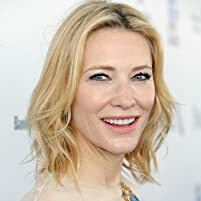 Cate Blanchett=Tour De Force Performance! 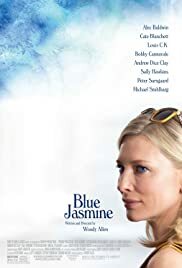 I have never been interested in any Woody Allen films in the past, but over the course of the past year or so, I have gradually become interested in his films and I'm glad because he is actually a film genius, as evident from this film, Blue Jasmine. Blue Jasmine offers a roller-coaster ride of emotions from light comedy to downright depressing. Woody offers up his distinct style of dialog in his screenplay and it's put to good use by Cate Blanchett who delivers one of her best career performances. Woody Allen's film is about a woman named Jasmine who was quite a rich socialite in Manhattan married to a wealthy businessman named Hal. When Hal is arrested for swindling, Jasmine loses her home and wealth and is forced to move to San Francisco to move in with her sister, Ginger. From there, we see the emotions Jasmine goes through as she is having a hard time moving on. 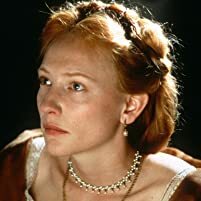 As said before, Cate Blanchett may have given her best performance and that is a tough feat. Her emotion is so raw and her pain is so real and even though I don't care for people with her kind of snobby attitude, I couldn't help but feel a little sorry for her. Alec Baldwin does a good job as Hal, the man with the money and the affairs. Sally Hawkins delivers quite a performance as Ginger, who is suffering from problems of her own. Finally, Bobby Cannavale does a great job as Ginger's boyfriend who makes it clear his distrust for Jasmine. Overall, Blue Jasmine is an excellent film but I'm not sure if being labeled as a comedy would work in its favor. The movie is just too depressing at times. I was also reminded of the Bernie Madoff scandal here and Jasmine seems to deliver the emotions Madoff's wife must have gone through. This is a well-acted and well-written film that touches upon the subject of life-altering changes and their effects. I rate this film 9/10.